The following is a guest post by Garris Shipon. We've touched on the four types of CSS testing here before. Regression testing is the hardest. It's the type where you're trying to test if a change you made to CSS resulted in any unexpected visual problems. This is made more difficult with responsive designs. Garris built a tool for doing this as he embarked upon a new responsive design for a large scale site. Here, he'll walk you through the whole thing. This article was originally published in December 2014. 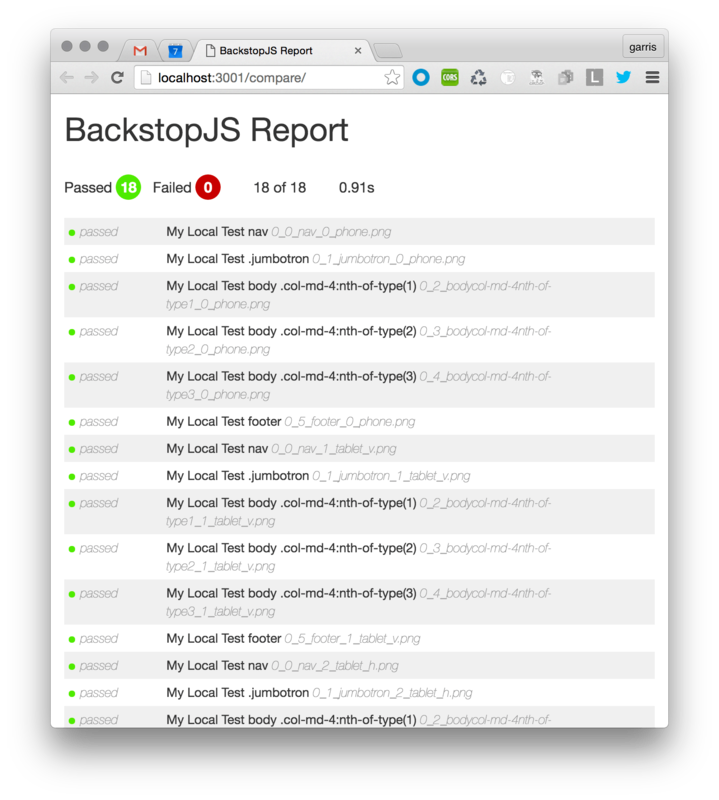 It has been re-written, updated, and republished now in April 2016 because BackstopJS, the main tool presented here, as been updated. Do a search for "CSS regression testing" and a common theme becomes clear: breaking CSS is easy, testing it is hard. This was the case at the onset of a responsive CSS refactoring project I scoped for a large online retailer. Like many other web companies at the time, we were in the process of adding responsive behavior to a massive e-commerce web app, which was originally designed for 1024px desktop screens. I realized this would be a regression-prone job. Retrofitting multiple breakpoint behaviors meant we would likely have a lot of hard-to-find display bugs. I needed a way for our engineers to automate bug discovery before slamming our QA team with hundreds of ticky-tacky little layout issues. The solution I wanted had to play nice with web developers. That is, easy to install locally, use familiar web dev paradigms, and give a reasonable amount of confidence that a selector change made for mobile isn't going to result in a hard-to-find bug in a desktop layout. At the time, there wasn't anything out of-the-box that quite fit the bill. This was the reason for creating BackstopJS. BackstopJS is a visual regression testing app which wraps CasperJS, PhantomJS and ResembleJS in an easy-to-configure test matrix across multiple app-states (URLs), DOM elements and screen sizes. The following is a 15 minute walk-through of an installation and initial configuration of BackstopJS. This instructional will be based on a simple demo project (download ZIP here). 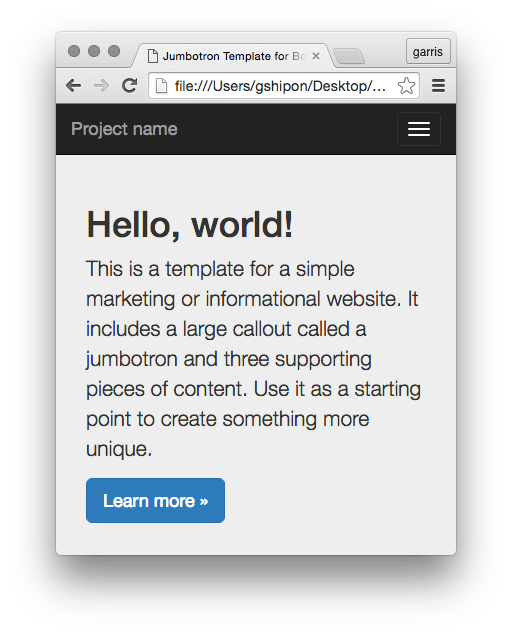 It is taken directly from the Bootstrap example page. 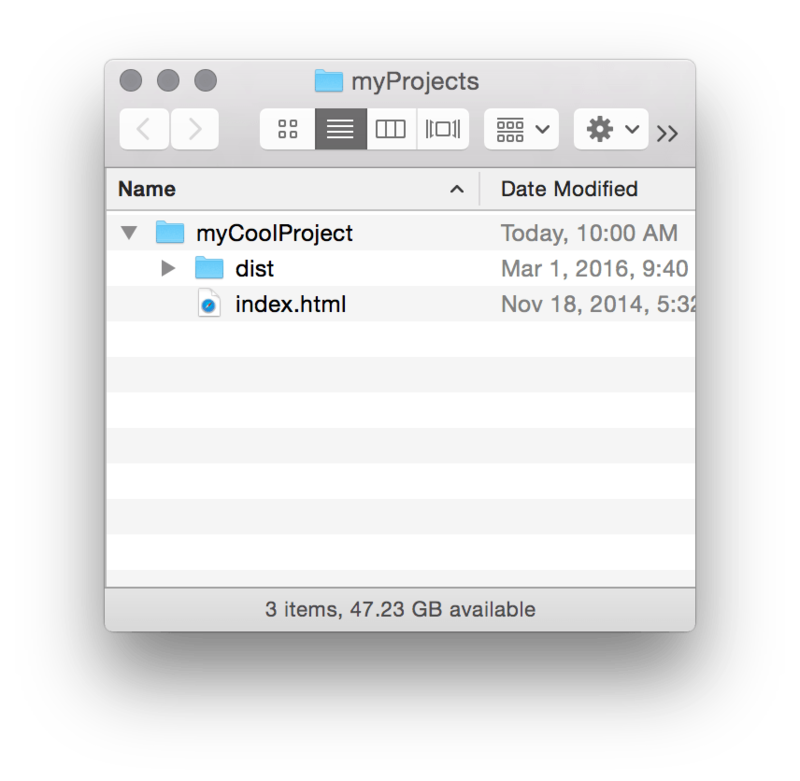 Here is what you'll see if you open up myCoolProject/index.html in a web browser... Remember, it's responsive. So, make sure to resize the browser window down to see the most narrow layout! 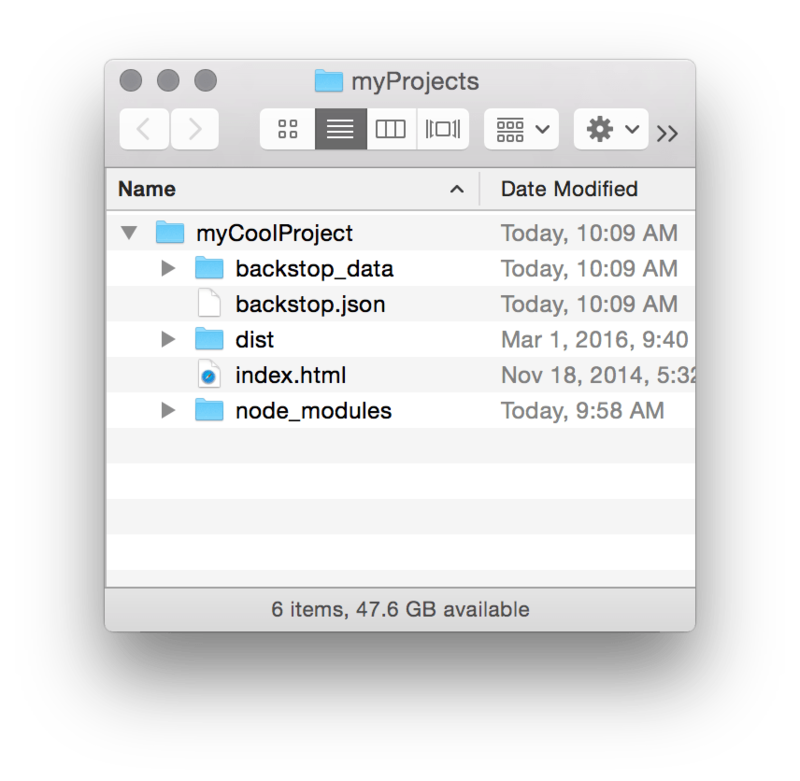 The rest of this tutorial will require the Node.js environment and it's integrated package manager (npm). If you don't have Node and npm installed you can get it here! This will add files to your project root: folders for BackstopJS screenshots, `backstop_data`, and generating a boilerplate configuration file `backstop.json`. In this configuration you can see three viewports objects. One for phone, tablet vertical, and tablet horizontal, each with name and dimensions properties. You can add as many viewports objects as you need. BackstopJS requires at least one. Then we have scenarios which include the URLs and element selectors that BackstopJS will test. It's useful to think of every scenario object as a test for a specific static page or global app state. Add as many scenarios as you need. BackstopJS requires at least one. Inside each scenario is a list of selectors. Selectors accept standard CSS notation. For each selector you specify, BackstopJS will take a screenshot and test that area of your layout. Your selector area could be as small as a button or as big as the body of your page — check the documentation for more on using this feature with dynamic web apps. You may notice that in the config we just generated, our URL is pointing to http://getbootstrap.com. That is what we would be testing if we were to run BackstopJS now. This is here to illustrate that BackstopJS can point to local or remote URLs, so it's easy to imagine re-purposing the same tests for local development, QA, staging and production environments. For our demo, make the following change and replace the scenarios node in `myCoolProject/backstop.json`. So far so good. We have our reference set. Now let's run a test! We are about to run our first test. But keep in mind, we haven't changed anything in our CSS yet, so our tests should pass! 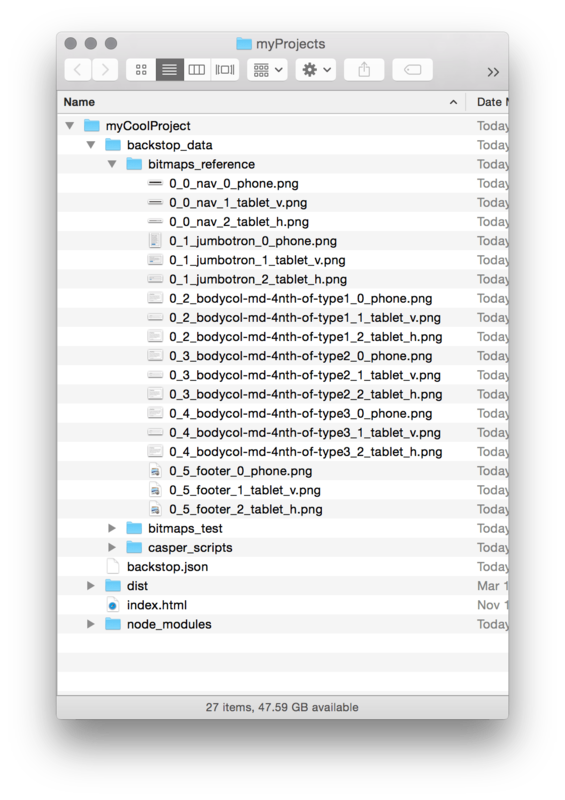 This task will create a new, timestamped-directory of test images inside `/myCoolProject/backstop_data/bitmaps_test/<timestamp>`. Once the test images are generated, BackstopJS will open your web browser and display a report comparing the most recent test bitmaps against the current reference images. Significant differences (if any) are detected and shown. In this instance, since we haven't made any changes to our test page, BackstopJS should show all of our tests as passing. Now, let's try changing our CSS and see what happens. Our visual diff contains the reference capture, the most recent test capture and the visual diff file. There you have it: regression found! This is a very simple example. In real life, designers and engineers may find themselves working on very large and or complex CSS projects. That is when a system like this really improves the quality and consistency of our work. By automating the repetitive visual tasks we can confidently pursue more creative ones. There are many ways to integrate this kind of test into your workflow. You could fire off tests every time you build or you could manually run tests (as you work or just before pushing to your next stage). You could even integrate BackstopJS into your CI pipeline, if that's your thing. All of these topics are outside the scope of this article. Check the documentation for more info. SPA testing support - Use Casper scripts and explicit web app triggers to ensure screenshots are captured at the correct time inside your web app (e.g. after API responses, after CSS animation completion, or wait for any other watchable async process). Simulating user interactions - Use Casper scripting inside your scenarios to simulate interactions with your on-screen components. CI pipeline integration - BackstopJS CLI features have enabled advanced users to make visual regression testing a part of their continuous integration process. Active configuration files - Enables active (node module) logic inside your config files which you can use to change testing behavior based on environment or other conditions, point to different config files to use your BackstopJS instance as a centralized test server for multiple environments, verticals, profiles, projects, or whatever. Find documentation, file bugs, get troubleshooting help, learn about advanced features and contribute on GitHub! I am continually amazed at how much there is to learn about web development. However, this still feels very exciting. Amazing stuff, can’t wait to check this out. I really like where the web is going. Cant wait for more browser engine support. I ran in to one problem installing. Cool story bro. Too bad about that document.ready() bit, that’s a dealbreaker here. Looking forward to next year’s update! Same here. I was really excited until I read that last paragraph. Cool tool though. Looking forward to the future improvements. BackstopJS would wait to run a test if consoleOrWindowReadyEvent is truthy. So your app would decide when it’s view is sufficiently loaded and emit (e.g. ‘everythingIsReady’) on the console or window node — then the snapshots would run. What do you think about Gemini? * CSS test coverage statistics. http://sourcejs.com/ is planning to add support for gemini too. Your framework is by far better than these (as they don’t screenshot components, only full pages), but this also allows the option for image comparison using GraphicsMagick (which must be globally installed). If there is one module I would want users to globally install it would be GM rather than Phantom or Casper as I found image comparison in Resemble is extremely slow and in GM it is almost instant. Also, why not publish this to NPM as well and save the users the step of having to cd into a Bower repo and npm install? Finally! I was dreaming about something like that, but was to lasy to make own research. Now, when it was given almost on the plate I will totally make an use of it. TY! Charlie, I really like the process detail and thoughts in your article as well! I would also be interested in how this might be combined with grabbing components for a style guide, as well as a workflow utilizing uncss. I’m new to Grunt/Gulp, so hope I’m not stepping in too deep. Chris, you rock as usual! Visual Regression Testing, if for testing in a blog like wordpress how. is there a tutorial here on discussing visual testing on wordpress? The issue I’ve found with image based testing is that it doesn’t work well with dynamic content. 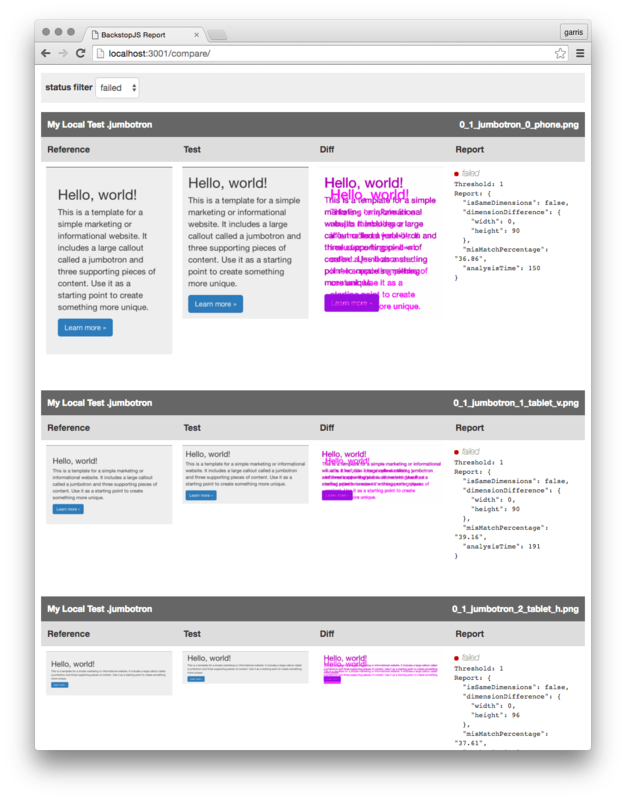 On a recent project made up of multiple single page apps, we used the Galen Framework for a hybrid approach: image comparison for static components and UI measurements, content testing and css rule checks via Selenium. Galen handles both. It does require some configuration, but it also works with Browserstack/SauceLabs to help avoid wrangling vms and to provide testing on real devices. In terms of complete test coverage, I haven’t found anything comparable. I am by no means a master as you are. But for “unexpected visual problems” I have done a few tests on changes in the past and tried in various browsers etc. – only to receive emails shortly afterwards after applying the changes to a website, from users telling me they had such and such problem with site’s appearance in EXACTLY the same browser I had already “satisfactorily” tested with. However, the bitmaps reference is of course still a brilliant idea to catch stuff I might not even have “seen” in the first place! why not publish this to NPM as well and save the users the step of having to cd into a Bower repo and npm install? 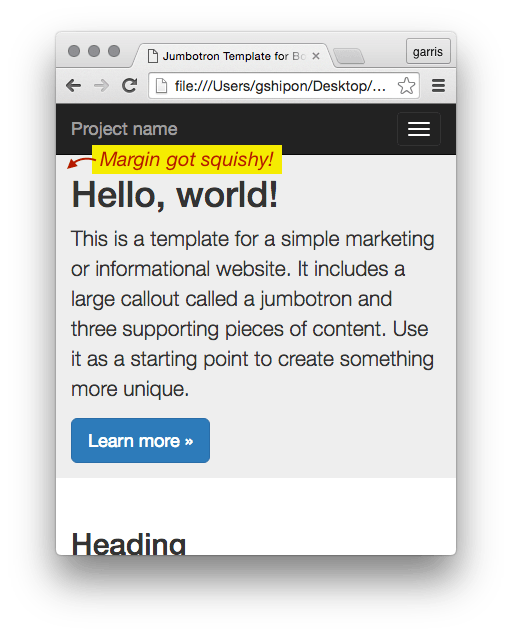 Site under test normally has a dynamic content. It means the content can be changed and regression tests will fail. I solve it by keeping on dev environment a styleguide section. Those are static HTML pages with every single styled component on them. Besides test-ability, it also a good proof that CSS in general is designed decently. Being a sort of a gallery, the styleguide is quite handy when picking a component for reuse. Moreover, technically that makes it close to unit-testing. Regressively or not, that way, in fact, we test every component styles independently and get notified of a problem regardless of context. Is there a version of this tool that does not require NPM and Node? I have no interest at this point in time to try Node, and no plans in the future, but it seems like a lot of neat tools get built with it. Gemini is probably the standout right now. It utilises Selenium and PhantomJS, enabling cross-browser regression testing. Great post and thanks for sharing Garris Shipon. I have the same error as you. Did you find some way to solve it?